At Kaya, our vision and therefore our breeding objective, is to see the Dorper and White Dorper as a “maternal” breed in the Australian environment. This means that we are selecting the Dorper and White Dorper as the female in a meat producing enterprise. That commercial Dorper will then be mated to a “terminal” breed such as a Poll Dorset, White Suffolk, Texel, or some other high growth, high muscled, very lean animal to produce slaughter animals, or mated to the Dorper to breed self replacement animals. In selecting a “maternal “ breed our emphasis is on high fertility, high maternal weighing weight, low birth weight, and ease of care. Carcase traits are important but are secondary to the “maternal” traits listed. 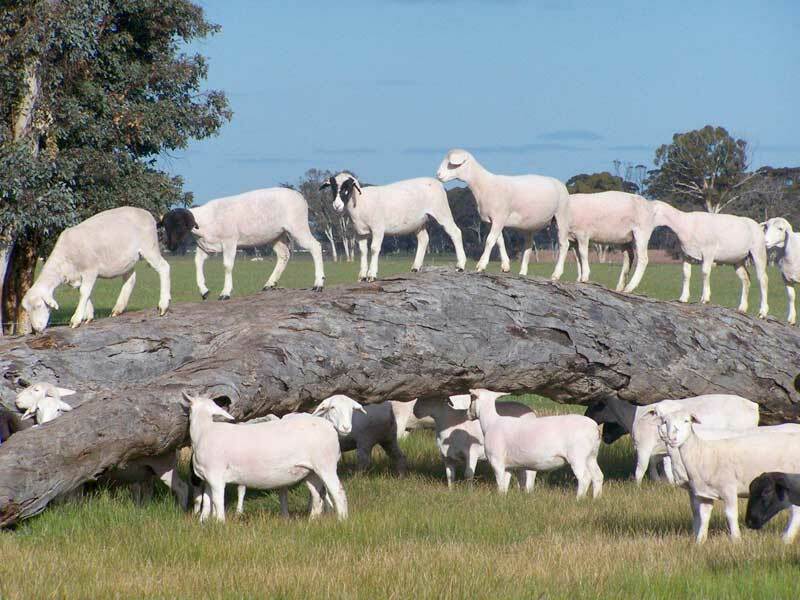 In our selection we have a very strict criteria based on the International Dorper and White Dorper Breed Standards and we also utilise performance records through Sheep Genetics Australia and their Lambplan EBV system. Our aim is to produce a Dorper ewe that will satisfy the International Breed standards and wean her body weight in lambs at each mating. We constantly “hear” of the rapid development of an Australian Dorper that is very different from the original Dorpers imported. “There are many breed traits that are unique so until we understand those traits and the consequence of change, Kaya will continue to use the International system in conjunction with our performance records and change if required at a controlled rate”. To be retained in the stud, all rams and ewes have to excel in the Subjective traits as well as being well above average in the Performance traits. As of July 2006 Kaya will mainly use Type 5 ewes in our stud and very good Type 4 or 5 rams. At Kaya we strongly advocate the use of the International Dorper Breed Standards and the inspection of animals by an accredited Australian or South African inspectors. Kaya employs an inspector 1 to 2 times a year to visually evaluate our stock. In the past we were very fortunate to have those duties shared between Mr Rodney Rayner (47 years as a Dorper inspector) and Tien and Margaret Jordaan (20 years as a top breeder in South Africa). Tien and Rodney were instrumental in getting us on the correct track and we appreciate the advice and knowledge that they were happy to share. The aim of this system is to breed an animal that satisfies a number of recognised visual standards. This includes Conformation, Size, Fat, Colour, and Covering. The animals are appraised and given a standard for each of the traits and then a final “Type”. The reason we use this system is to enable us to produce a uniform flock that can be sold with confidence around the world. When we advertise a Type 5 animal, our clients know that it is going to be of a certain standard. Conformation – this is a trait that is well recognised in all breeds. Well conformed animals, on average, are more attractive and perform better. Size – mature size of an animal is a trait that everybody seems to want BUT is it economical? A 50kg ewe requires 1kg dry matter per day whereas a 70kg ewe requires 1.2kgs per day or 20% more. Therefore selection pressure against oversized animals is required to have a commercially viable enterprise. Our aim is to produce a 60-70kg ewe that will produce her own body weight at each lambing. Colour – although colour has a limited influence on the performance of the animal, it does have a major influence on the dollar value of the animal in the stud market. 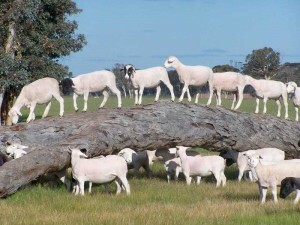 Cover – the ability of a Dorper to “shed” its fleece and to be “non shearing”, “non crutching” and “non mulesing is the major reason why the breed is unique and in our opinion is a major selection criteria. In a worldwide market where wool harvesting is a major problem, “shedding” ability is the number one trait. Fat – although our meat consumer dictates that we have lean meat, the Dorper requires a good even cover of fat to retain the fertility and ability to survive under tough conditions. “Wet” sheep with a good distribution of fat over the entire body do better in tougher environments. Hardiness – the Dorper has the unique ability to flourish under difficult environmental and nutritional conditions. It is imperative that this ability is not lost and it is a trait that is very hard to measure when sheep are fed in artificial environments (ad-lib). We measure and select our sheep while on grazing so we can identify the better performing sheep under natural conditions. Reproduction – the Dorper has an exceptional reproductive rate under difficult nutritional conditions and has shown excellent mothering abilities. Conformation of the udder and teats are very important traits as well as the ability to lamb more than once a year. To improve the animal in a scientific and objective manner we also use Sheep Genetics Australia to evaluate the objective performance of our animals. In December 2006, of the 2834 Dorper or White Dorpers recorded in performance schemes in Australia, 1789 of them were from Kaya Dorper or White Dorper (63%). BWT – Birth weight – aim is to retain or reduce slightly. WWT – Weaning weight – aim is to increase. PWWT – Post weaning weight – aim is to increase. PEMD – Post weaning eye muscle depth – aim is to retain or increase slightly. PFAT – Post weaning fat depth – aim is to keep stable with a slight increase. MWWT – Maternal weaning weight – aim to increase. NLW – Number of lambs weaned – aim to increase. In 2005 SGA developed a breeding objective index which was named the “DORPER $” index. The aim of that index is documented in this PDF file. All our performance data is easily accessible by using the Lambplan website in the following manner.